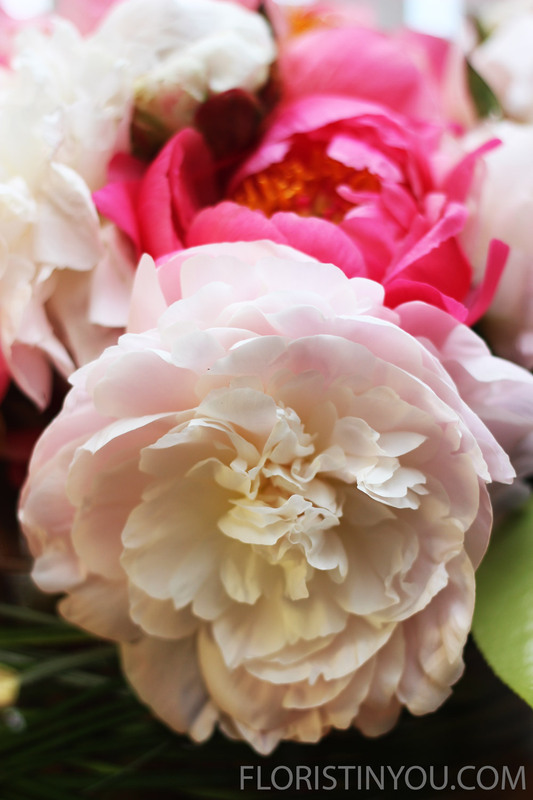 The long awaited Peonies are finally here. These showy blooms have a relatively short season, only a few weeks, so enjoy their beauty while you can. In California, their bloom season starts around the later part of April to early June. 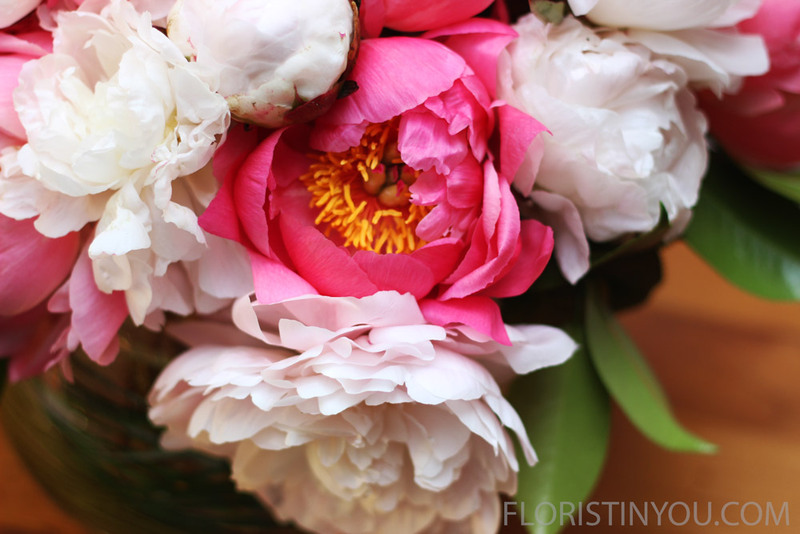 Peonies are native to North American, Asia, and Southern Europe. They derive their name from a figure in Greek Mythology, Paeon. According to myth, Paeon, a student of Asclepius (the god of medicine and healing) was turned into a flower by Zeus, to save him from the wrath of jealous Asclepius. The Peony in China, Paeonia suffruticosa, is called, 'King of the Flowers' and likewise in Japan, 'King of Flowers', a fitting tribute to its beauty. 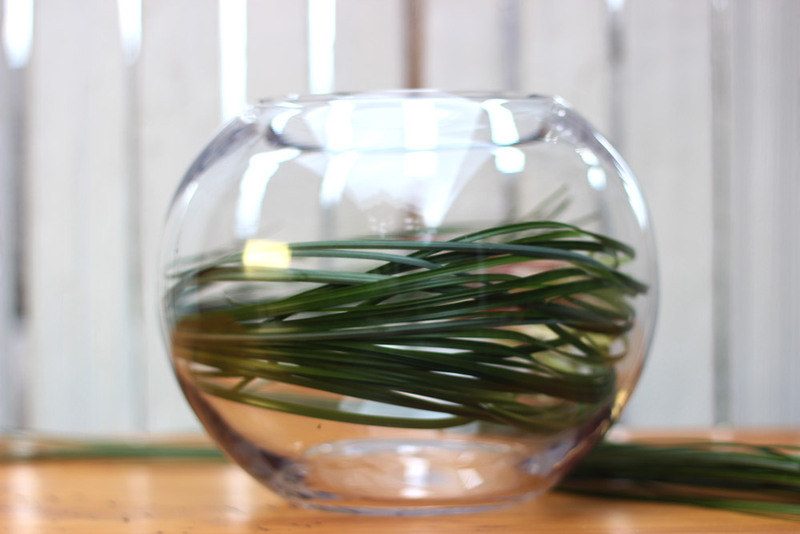 'Bear Grass' is used in this arrangement to swirl around the inside of the bubble bowl. 'Bear Grass' adds color and line to the arrangement. 'Bear Grass' or Xerophyllum tenaxis is actually part of the lily family. It grows in the sub-alpine meadows of Western North America. The bears may be able to lie around in this, but be careful handling this. It can cut you. TIP: When selecting your bubble bowl, get one that is between 1/4" - 3/8" thick. You can buy a vase like this (click here) When it is filled with water it is heavy and less likely to break with a thicker glass. Always make sure to lift it from the bottom with both hands, and never pick it up from the top rim. Also, select a bowl with a small opening. This one has a 5" opening. 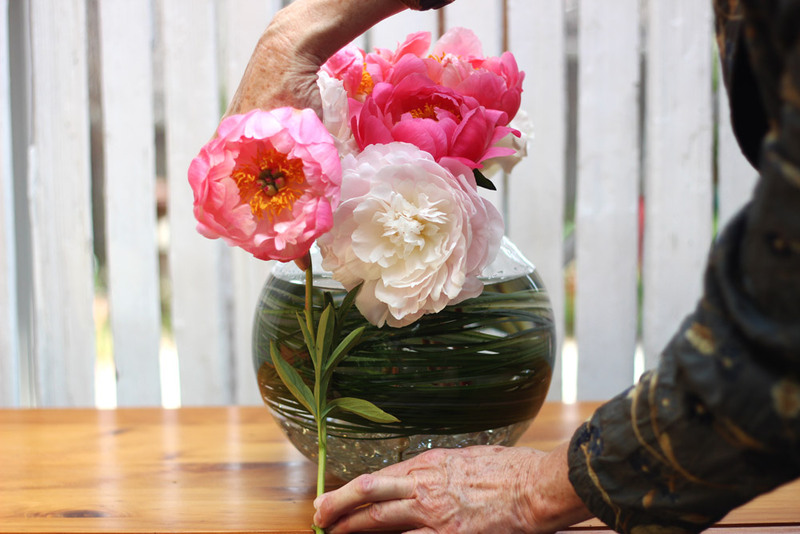 The larger the opening, the more stems you need to fill it. 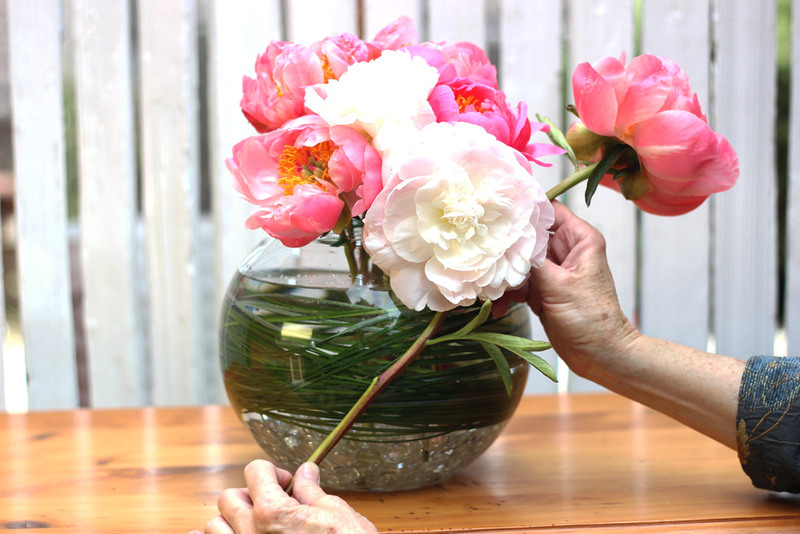 For this arrangement, you will construct a grid out of waterproof floral tape to hold the flowers in place. 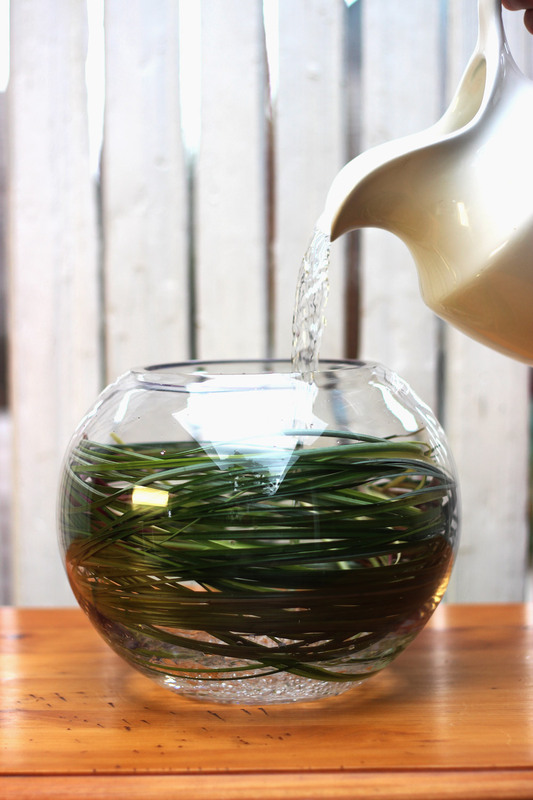 The clear flat marbles in the bottom of the bowl serve to anchor the flower stems and keep them in place. Are you ready? Here we go. This one is easy. The golden staminodes of this fushia peony look like silken tassels. 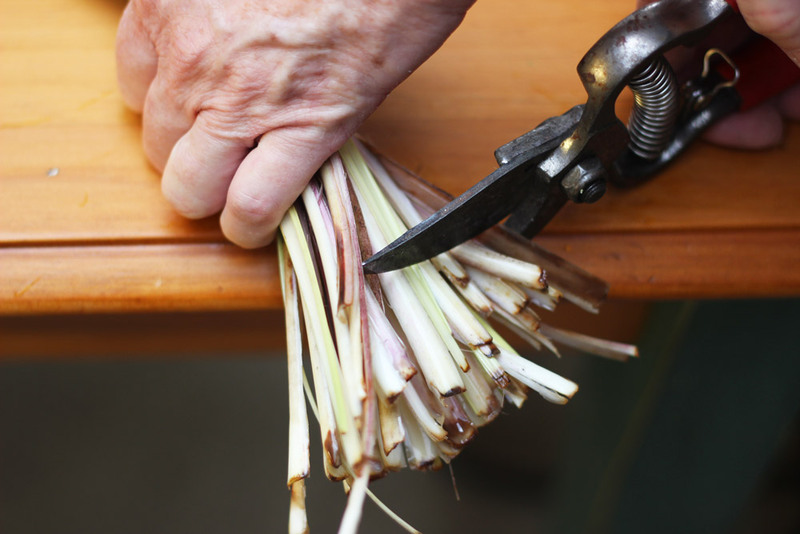 Cut ends off 'Beargrass'. TIP: Be careful not to get a 'paper-cut' from them. Place first bunch around inside of bowl, with ends to the back. Start next bunch with ends 3 - 4" over. Tuck ends behind grass so you don't see them. 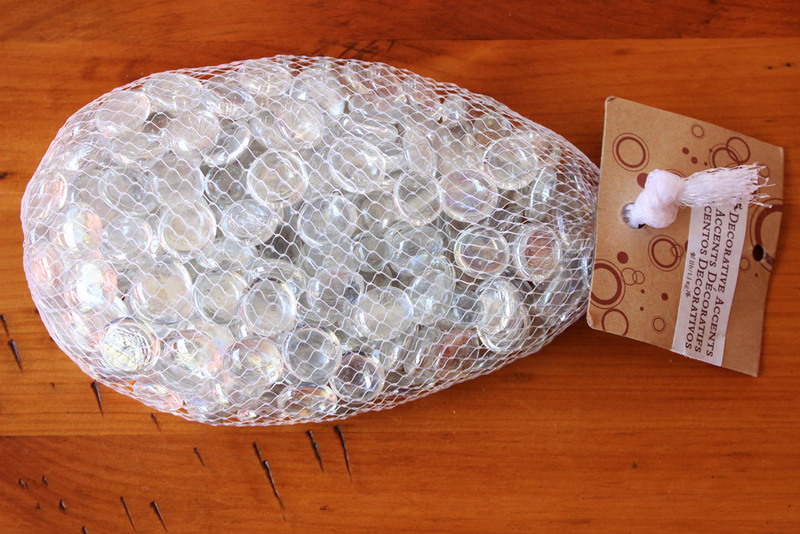 Carefully place clear flat marbles from one bag into bottom of bowl. Fill with water up to 2 inches below top. 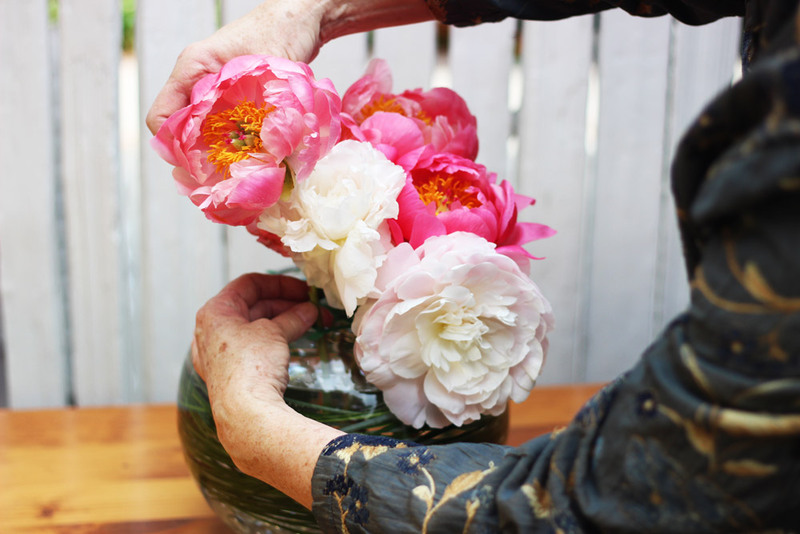 Use waterproof tape to create grid to hold flowers in place. Find at craft stores. Make grid with spaces less than 1" apart. Press tape firmly down on edges. Cut 4 blooms at 13" and place in center. Use fingers to guide stems straight down into marbles. Cut large flower at 10". Place low in center as focal point. Measure next cut. Measure 2 side blooms at about 15". Cut and place both sides. 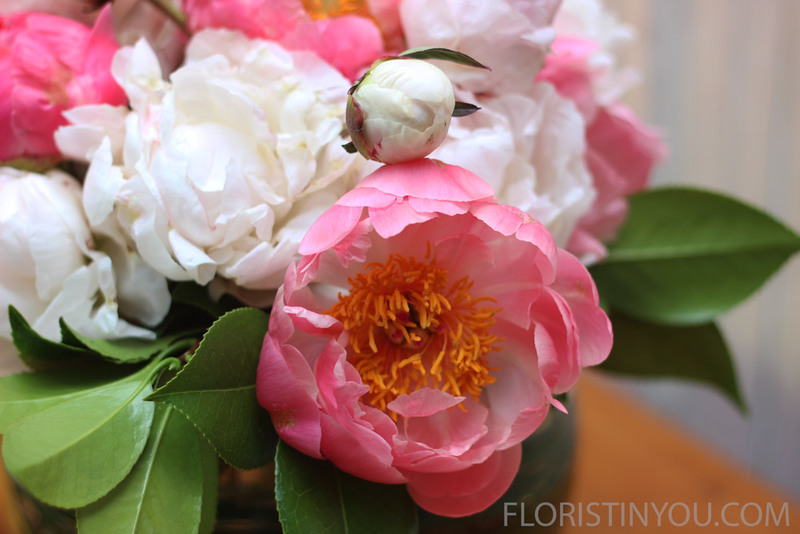 Measure blush peony for right side. Repeat for left side. 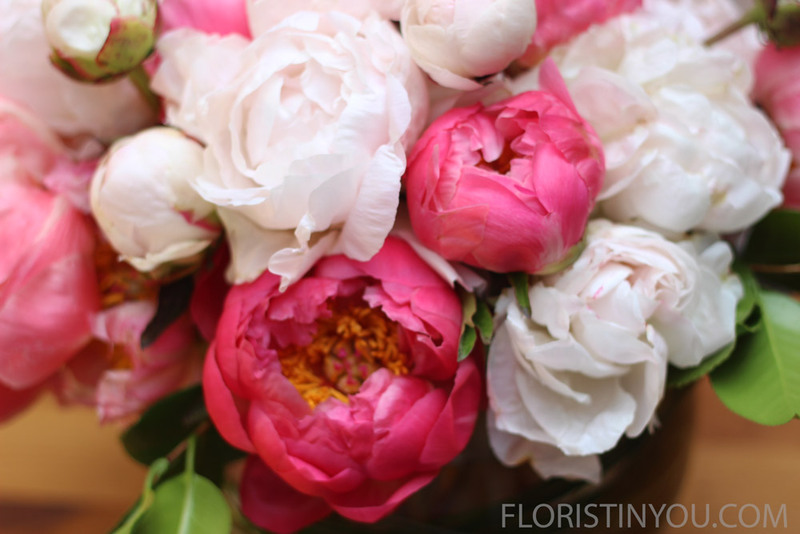 Place blush peonies on both sides and add buds in center. Cut 6 camellia leaves or lemon leaves. Add 3 to front and 3 to back. 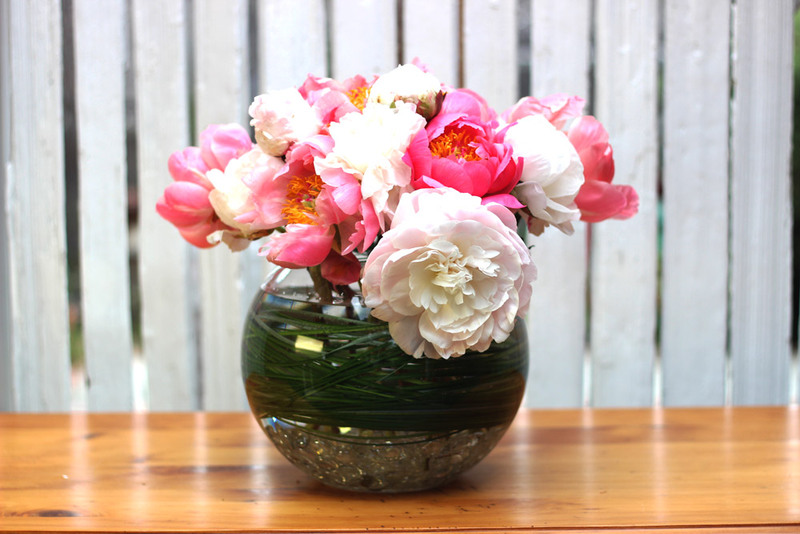 Arrange rest of blooms in back with large bloom for focal point, low in center. Like fushia chiffon and golden silk. Adieu, King of the Flowers.